Everyone knows that when analyzing point spreads on NFL games, you have to account for three points for home-field advantage. Thus, if Vegas sports books have the home team in a game favored by three points — as they currently do with the line of IND -3 for Bengals at Colts in Week 1 — it means that the two teams are rated as equals. But all home-field advantages aren’t created equal, and professional bettors know that. The Seahawks at their peak felt nearly unbeatable at home, while the Packers with Aaron Rodgers seem to beat their ATS record at home year in and year out. In fact, since 2009 (Rodgers’ second year as starter following a 6-10 run in 2008), the Packers at 76.3 percent are second only to the Patriots in ATS cover percentage at home. Want more picks? At SportsLine, I’ve posted analysis of the Super Bowl betting lines and five win totals I like. Sign up for a subscription with promo code PARLAY to get your first month for $1! One of the key things I do each year in preparation for the NFL season is calculate a weighted home-field advantage for each team. This tells me where I might need to adjust my HFA numbers for each team heading into the season. To do this, I look at how many points a team scored and allowed at home and on the road over the last five years, with the most recent year comprising 50 percent of the equation, two years prior at 25 percent, and so forth. The differences in the home and away totals are added together for offense and defense, then those numbers are averaged to find a raw HFA total. It’s a bit rudimentary, but it’s worked for me in the past, so long as I don’t take the raw numbers as gospel. Here’s a look at that data, with the final column representing my starting HFA for each team in 2018. I’ll follow up with some notes. Best weighted HFA goes to … Miami? 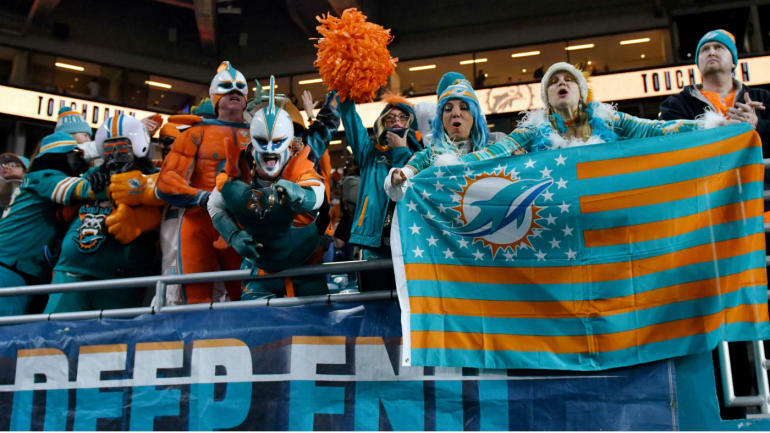 The team that springs to mind as having the biggest home-field advantage in football certainly isn’t the Dolphins, and they may not even make some experts’ top 30. But this team is consistently much better on both sides of the ball in Miami, including scoring 24.1 points at home last year and 25.4 the year before, as opposed to 12.4 and 19.4 points, respectively, on the road. The Dolphins also gave up 6.5 fewer points per game at home last year, though on defense they tend to be just as good (or bad) at home as on the road in most seasons. Even though the wHFA number suggests the Dolphins are 5.45 points better at home, I’m not quite willing to give them that much of a home-field advantage, thanks largely to playing last year entirely with a retread QB and their historical trend of not being that great at home. Still, the numbers are enough to bump them a half-point over a standard team and give them a HFA of 3.5. The Rams‘ wHFA total should be heavily discounted thanks to three of those seasons coming in St. Louis. We just don’t know how well they’ll play at home historically after two years. But the L.A.-based squad has done its part to earn one of only two negative wHFA marks in this year’s data, as the Rams scored 24.5 points per game at home and 32.8 on the road, with defense also playing 3.6 points better on the road. At that even counts the team’s 33-0 win in London as a “home” game — the true total is actually a a bit more skewed. Los Angeles is a city of transplants, and it’s reasonable to assume the Rams will have to deal with playing in front of some hostile home crowds again this year, even as the team is finding success. I’ve marked them down with an HFA of 2, but it could be even less in certain matchups. The biggest takeaway from this team is that they can reasonable erase some or all of another team’s home-field advantage when they hit the road, especially for a team that’s not historically great at home or isn’t that competitive this year. The Cowboys consistently grade out as having one of my worst wHFA numbers year in and year out. You can speculate as to the reasons why, but last year’s Cowboys offense did better on the road than they did at home after a great run at home in 2016 (29.3 points per game in Dallas and 23.5 on the road). The defense has shown better on the road in three straight seasons, giving up no more than 18.5 points per game as the away team in each year since 2015 and no fewer than 21.3 points per game in a year in Dallas over that same stretch. That 2016 version of the team gives reason to be hopeful if you’re a Cowboys fan, as that’s when the home/away gap has been at its best on both sides of the ball over the last three years. But they’ll have to prove it to me, as I’m starting them with a HFA of just 1.5. That ties them for the worst HFA alongside the Bucs, who have performed worse at home offensively for four straight years. The Cardinals get an HFA of 3 of three despite a great weighted mark as I expect this to be a non-competitive year for them, causing less interested crowds at home. The Broncos consistently have a great HFA, even when the team as a whole is playing poorly, as they did last year. Expect that to continue, and I have them tied at the top with a HFA of 4. Chalk up the Packers’ lower-than-usual wHFA to a season where Aaron Rodgers only played three games at home. I’m still giving them a 4 in HFA. The Texans have one of the top wHFA marks in the league, and I expect the excitement to be there for a fan base that gets to watch Deshaun Watson. They could be a sneaky good team covering at home. The Chargers‘ wHFA number includes four years in San Diego and is largely irrelevant, but I was surprised at how much better they played at home in 2017 than on the road. I’m still knocking them a half-point as they’ll likely play in front of plenty hostile crowds, but I’m not dropping them as far as I did last year. The Patriots’ wHFA number is lower than you’d probably think, but they still went 8-2 ATS last year and have covered an NFL-best 82.8 percent of their home games since 2015. I’m still giving them a 3.5 HFA mark. You’d probably expect the Saints to have a great wHFA mark as well, but the defense continues to let them down, playing worse at home for the fourth straight year in 2017. I’m keeping them at 3 for HFA with the defense trending up. The Dolphins at No. 1 in wHFA is a shock, but the Jets are No. 2? Really? This team has been pretty good on offense at home in two of the last three years, and pretty bad at everything on the road. Don’t sleep on them for some home upsets. The Eagles are incredibly hard to score on at home, giving them a boost to 4 in my HFA total. Last year’s marks took things to the extreme, with the Eagles giving up 10.2 fewer points per game at home. The Seahawks have now been better defensively on the road in two of the last three seasons, and with that unit losing plenty of talent this offseason, I’m not comfortable giving Seattle any higher than a 3 in HFA. The Santa Clara 49ers are fighting against the poor location of their home stadium, but a franchise QB should spark interest. So I’m only docking them a half-point in HFA, even though historically the data says they should be lower.